Video of Deaf Woman Ordering at Starbucks Drive-Thru Goes Viral for All the Right Reasons! A brand-new Starbucks location in St. Augustine, Florida, is changing the way it interacts with its customers, especially those who are deaf or hearing-impaired. 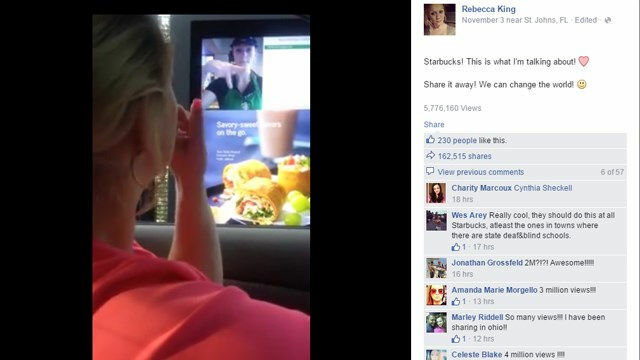 The video above, originally posted on Rebecca King’s Facebook page, shows her using sign language to complete an order with a barista for two coffees. The barista, Katie Wyble, signs back using the store’s two-way video screen. Since being posted yesterday, the video has already received more than 1 million views and over 75,000 shares. The community of St. Augustine is known to have a significant amount of deaf and blind residents.